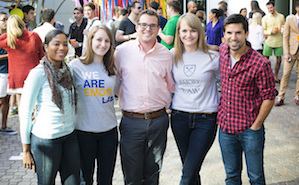 Emory Law is a dynamic community where students feel engaged and involved in the classroom and beyond. Our Houses program provides students with social opportunities to get to know faculty, staff, and other students. For 1Ls, the Houses help them bond and meet 2Ls and 3Ls, who have “been through it already” and who can provide perspective and realistic advice. For 2Ls and 3Ls, the Houses are another channel for forming relationships that energize their interests, goals, and future paths. And the Houses inject fun into law school life! LLM and JM students have similar opportunities through their respective Societies. We encourage students to take part in all law school activities. Emory Law fosters a climate of inclusion, where students of all backgrounds come together to learn and enter a profession based on service and knowledge. Our diverse community, with students, faculty and staff of all races, genders, religions, and backgrounds, is engaging, warm, and dynamic. Generations of Emory Law students have built a community of high-achieving but mutually supportive young professionals, committed to their growth in the legal profession while understanding that the bonds and reputations they forge in law school will follow them throughout their professional careers. Contact the Office of Academic Engagement, located on the ground floor of Gambrell Hall in G131, G132, and G145.